Shannon Greenfields of Big Scrub Landcare talks with Georgie Jones of Envite Environment about camphor conversion. Shannon: What are the options for landholders that want to get rid of camphor laurel on their property? Shannon: So, what exactly is ‘camphor conversion’? Georgie: ‘Camphor conversion’ is a process that strategically kills camphor laurel to promote the growth and regeneration of rainforest plants. In mixed rainforest / camphor laurel stands, the resilience of the forest can be utilised, initiating an enhanced natural regeneration response and forming regenerating rainforest stands in a cost-effective and proven manner. Shannon: What are the methods used to kill the camphor laurel? Georgie: First you have to select a patch size you can maintain. Camphor conversion involves removing all exotic species from the ground and mid-storey first before killing camphor laurel in the canopy. 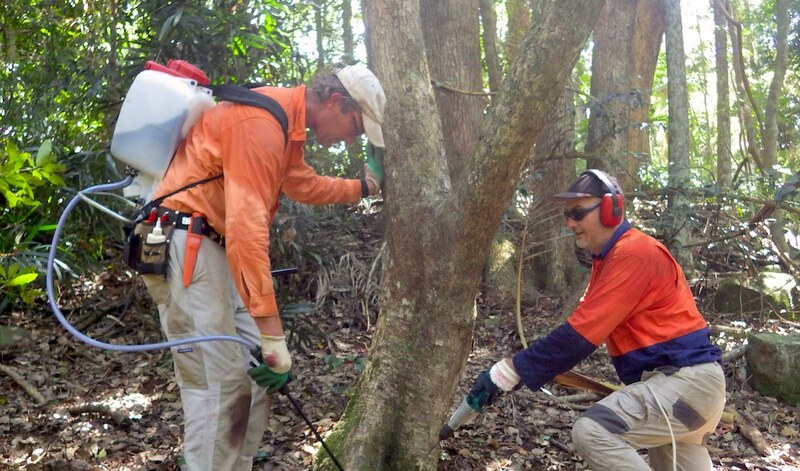 Generally larger woody weeds in the mid-story and canopy such as the camphor laurel are stem injected, which involves drilling holes in the camphor and applying herbicide in the holes. Following stem injection, woody weeds defoliate and begin to degrade. 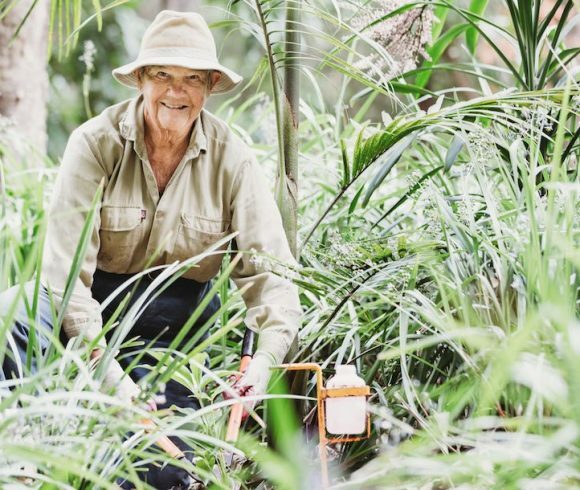 The resulting rapid increase in light triggers germination of native plants and weeds such as small leaved privet, corky passionfruit, tobacco bush, giant devil’s fig and climbing nightshade. Further stages of work controlling germinating weeds is essential to ensure that rainforest species regenerate successfully in place of weeds and in some situations replanting native species may be required. The treated camphor laurels can be left ‘in situ’, where they provide perches for birds, which can bring in seed useful for rainforest regeneration. The camphor eventually crumbles from the top down, this is the most cost-effective option for removal. Another more expensive option is to remove the injected camphor with an excavator that has a Fellabuncher head, the excavator grabs the camphor trunk, chainsaws the tree and lifts it away from any native trees close by. This technique physically removes the camphor which can sometimes be dangerous if left ‘in situ’ and allows the existing and planted rainforest plants to grow unhindered by falling branches and trunks. The removed camphor then can be cut into sections and left to degrade in a pile or mulched through a chipper. Shannon: What about just cutting them down? Is that expensive? Georgie: Yes generally it is not recommended as it can be expensive to drop and clean up and can cause a lot of damage to surrounding natives. Shannon: Have you heard that argument that camphor laurel actually provides habitat for rainforest plants and birds? Georgie: Although camphor laurel stands can provide habitat for some rainforest plants and animals it is generally desirable to replace stands of camphor laurel with rainforest, particularly where the intention is to manage the land for conservation purposes (e.g., on steep slopes, in wildlife corridors, along creeks, or near remnants). Shannon: So how is the Big Scrub Landcare Camphor Conversion project going? 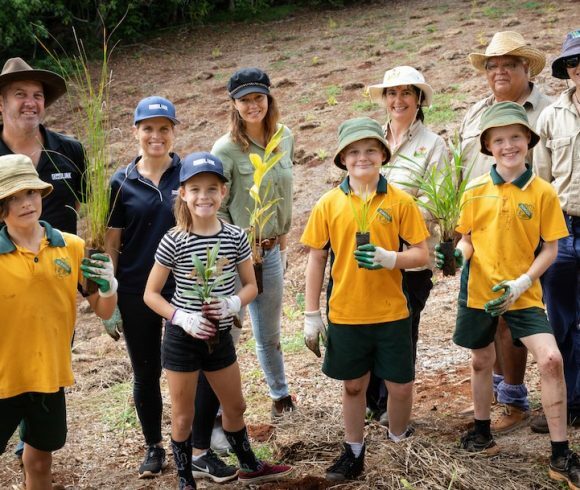 Georgie: It’s going really well … we have been currently implementing stage 2 of the project which is which has been funded by NSW Environmental Trust engaging over 19 private landholders with over 40ha currently undergoing restoration. Shannon: Great so have those landholders learnt the methodologies for camphor conversion and will they be able to implement those methodologies after the funding is finished? 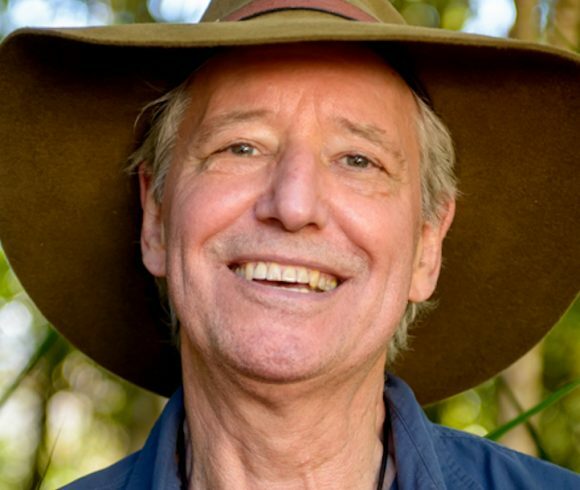 What about other landholders that want to find out more? Georgie: Yes, all participating landholders are committed to restoring vegetation on their properties, all provide additional resources to the project either working alongside bush regenerators learning plant identification and weed control techniques or by resourcing additional bush regeneration work and will be able to maintain the work once the funding is finished. Shannon: How long has this method been used by bush regenerators Georgie? What is the next step? How can we engage with more landholders to undertake camphor conversion? Georgie: The transformation of camphor laurel forests to rainforest has been developing for over 20 years, the techniques have been refined and are supported by observations made by professional regenerators, we are always learning new ways to increase the effectiveness and efficiency of these processes. The correct use of the equipment and the herbicides is important, and it is good to know there are a significant number of successful projects and professional regenerators experienced in this work. Landholders can always contact local council or their local Landcare group to find out about more information about grant opportunities or upcoming workshops and information sessions.